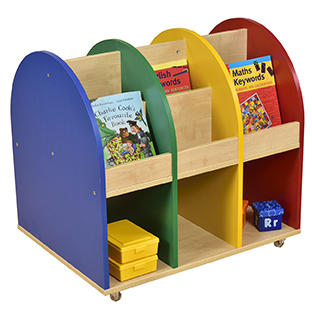 A bright and colourful mobile storage unit to enhance any classroom. Lots of storage and browsing space on both sides of this unit with 12 browser compartments and 3 large storage compartments underneath. Manufactured from 18mm maple melamine faced particleboard. Supplied flat packed with easy to follow assembly instructions and lockable castors.